Glyphosate weedkiller offering high levels of weed control. Dilution Rate: - 20 - 30ml of Rosate per 1 Litre of water is the minimum requirement for treatment. 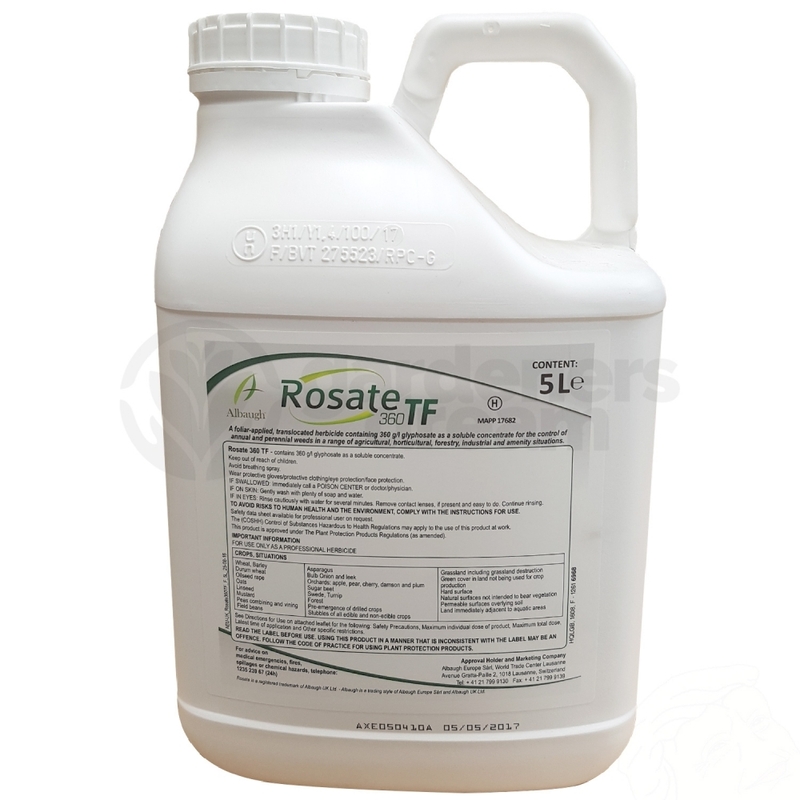 Rosate 360 TF is a high-level glyphosate weedkiller, providing control of both annual and perennial grass and broad-leaved weeds. Ideal for professional use, this Rosate weed killer can be used for contract spraying and helping to manage large areas of grass. The Rosate 360 TF is a soluble liquid concentrate herbicide. The heavy-duty solution is absorbed by the foliage, after which it spreads to the growing point of the roots, helping to eliminate weeds. The glyphosate solution is absorbed into the soil after application, where it is broken down. This means new crops can be planted quickly after use. Showing our 2 Rosate 360 TF 5 Litre Weed Killer reviews with an average rating of Excellent. Would you like to write a review? Sprayed it with advertised dilution and dried in fairly quick on a relatively warm day. Weeds started showing signs of dying off within a day or two and after a few weeks all were totally dead. Much better than the non-glyphosate ones which just make them look dead quickly then spring right back!